Mobile Tech giant, Nokia is surely back! Though to some fans of Nokia the company had gone oblivion. Even after Nokia Lumias started hitting the market after Microsoft took ownership the company still wasn't itself. Here is a surprise, the Nokia6 will be running an Android OS, not Windows. Not a bad decision right? who wouldn't want to join the moving train? But the good news is it seems Nokia is back for good into the Mobile phone industry. Let us look at some key features of the Nokia 6 gadget. -The smartphone comes with a 2.5D gorilla screen glass 3 and an aluminum body. -The screen resolution of the device is 1920x1080 pixel with a 5.5" LCD display. 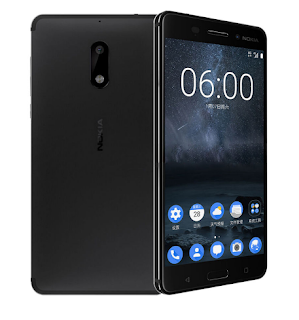 -The Nokia 6 smartphone comes with a powerful 16 mega pixel rear camera, 1.0µm pixel size, f/2.0 aperture, LED flashlight, and face detection feature. It's front camera has is 8 mega pixel, 1.12µm pixel size, f/2.0 aperture; 1080p video recording, according to GSMARENA. -The device runs an android 7.0 Nougat operating system, a Qualcom Snapdragon 430, Octa-core 1.4ghz cortex-A53, Adreno 505 GPU chipset. -One of the features I really don't fancy about this gadget is it's small battery capacity of 3,000mAh, and it is internal. -Nokia A6 comes with a dual-sim; Cat.4 LTE (150/50Mbps); microUSB 2.0; Wi-Fi a/b/g/n/ac; GPS; Bluetooth 4.1; FM Radio; NFC. The Nokia 6 isn't ticking all of the boxes, but at this price point we have no right to complain. There may be a lack of ingress protection or dual cameras, but the 6 does give you stereo speakers, which many flagships don't have. The 3,000mAh battery capacity is still a bit of a red flag, but we'll see how it does in the tests." Ever since HMD took over Nokia, the Nokia 6 it's first production. Earlier this year it was unveiled and has been on sale in China since two months ago, and a worldwide version is going to hit the market soon. As it stands, we've only laid hands on the Chinese version.